We have a proud heritage at Bender Cycle! In 1974 we made our first push rod kits. These quickly became known as the highest quality push rods available and have added over 800 individual parts to our product line. We are the largest manufacturer of aftermarket replacement parts to fit Harley Davidson® and similar type motorcycles. We carry push rod kits, internal engine and transmission parts, brake components, axle spacers and many more items. Our continued growth has resulted in an expansion of our manufacturing plant from a 3,500 square foot to a 20,000 square foot, modern, well equipped manufacturing facility with 17 full time dedicated long term employees. We in-house manufacture our products with multiple and single spindle screw machines. Full I.D. and O.D. grinding department, Induction heat treat and a newly installed automatic punch press line. This allows us to keep our quality and production totally under control. With our continual commitment to quality and large inventory, we offer fast reliable service and quality parts that you can depend on that are made in the USA by Americans with pride. Through the years we have continued to manufacture our products with the highest quality and performance possible. Our products are available through all major distributors in the USA and around the world. 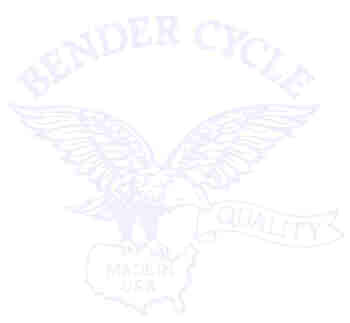 When you see the Bender Cycle Eagle, think of quality and service. Contact our distributors for a dealer in your area. Copyright© 1999 Bender Cycle & Machine Corp.